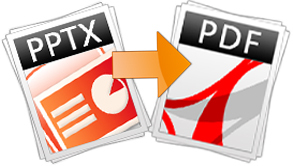 Convert PowerPoint to PDF and PS. PowerPoint Converter can convert Microsoft PowerPoint to many other file formats. It can convert PowerPoint to Flash movie, PDF, PS (PostScript), HTML and MHTML, and RTF formats. It also can convert PowerPoint to images, for example, PPT to PNG, PPT to GIF, PPT to BMP, etc. Vector image formats WMF and EMF are also supported by this application. Microsoft PowerPoint 2000/XP/2003/2007/2010 in Windows 2000/XP/2003/Vista/2008/7/8. PowerPoint Converter can convert PowerPoint presentations to Flash movies easily. It can retain the visual and audio effects of original PowerPoint in created Flash movie. This feature is the same as PowerPoint to Flash Converter. 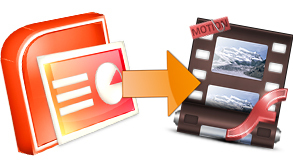 PowerPoint Converter can convert PowerPoint documents to PDF and PS. It also supports HTML (MHTML) and RTF as conversion target formats. With this feature, you can publish your PowerPoint in any one of formats above. PowerPoint Converter can convert your PowerPoint slides to images of many formats. 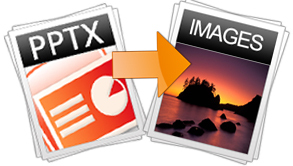 It supports bitmap image formats like GIF, JPG, PNG, TIFF, and BMP. It also supports vector image formats WMF and EMF. PowerPoint Converter provides a command line executable pptconv.exe. This command line tool needs an independent key to register, and the key is free if you have bought a key for the GUI executable. With this command line tool, you can implement script control during conversion progress. For more information, please see the user guide for command line. 1. Convert one PowerPoint document to one Shockwave Flash movie. 2. Keep more than 170 PowerPoint 2003 animation effects in Flash movie. 3. Keep all PowerPoint 2003 slide transition effects in created SWF. 4. Retain animation sound effects in format WAV, MP3, and so on. 5. Retain audio effects of slide transitions in format WAV, MP3, etc. 6. Able to convert special symbols in PowerPoint. 7. Able to support GIF clip arts in PowerPoint. 9. Option to set frame width, frame height and frame rate of Flash movie. 10. Support batch conversion that can convert multiple PowerPoint documents. 11. Able to enable effects of slide transitions and animations. 12. Able to transit slide automatically by time delay or manually by click. 13. Keep action buttons and hyperlinks. 14. Show or hide loading bar and control bar of Flash. 1. No need for other PDF viewer or creator software. 2. Option to set PDF descriptions, like title, subject, author and keywords. 3. Option to protect PDF with 48 or 128-bit encryption with user or owner password. 1. Support various image formats including raster formats of GIF, JPG, PNG, TIFF, and BMP, and vector formats of EMF and WMF. 2. Set image resolution, width and height with the command line tool.